View products at these supplier web sites. Herrman Lumber offers many types and styles of siding for either residential or commercial use. Check with your local store for product samples and availability. Wood siding in a variety of styles and species. For that natural look from a real wood product choose from bevel, channel rustic, log cabin, shingle styles and more. In natural long lasting Cedar. Can be painted, stained or use clear finishes for the truly natural look. Low maintenance vinyl siding in a variety of styles and colors. 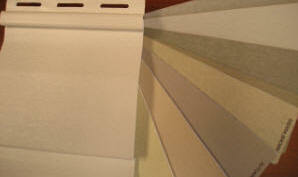 Choose from standard bevel patterns or Dutch lap designs with matching trim colors and textures. Sizes from double 4" and double 4.5". Easy to install. Never paint again. Cement siding comes in a variety of plank designs as well as panel styles in a wide range of sizes. Also available in prefinished colors. This products has a very high paint adhesion durability rating and extremely long life expectancy.